TLJ News: November 6-10, 2013. 11/7. Joaquín Almunia, Vice President of the European Commission for Competition Policy, gave a speech in Brussels, Belgium titled "Antitrust Damages in EU Law and Policy" in which he addressed a legislation proposal to make it "easier for the victims of competition-law infringements to seek compensation for the harm they suffered". Almunia (at right) said that "we need to ensure that all European citizens and businesses have effective access to compensation", but "we need to preserve the overall effectiveness of the EU-wide system of public authorities that enforce competition law". He said that "access to compensation is insufficient and unevenly spread in Europe", noting that only 25% of EC findings of antitrust violations are followed by private litigation, and that most of these actions are brought by large companies in the United Kingdom, Germany and Netherlands. 11/6. The Consumer Watchdog (CW) published and criticized the European Commission's (EC) October 21, 2013 proposed settlement [96 pages in PDF] with Google regarding its search practices. This document contains Google's proposed commitments. This proposed settlement contains no finding or admission of wrongdoing. Google is a US company. US antitrust regulators have already disposed of this matter. The EC is acting redundantly. The Federal Trade Commission (FTC) has conducted and completed a parallel review of the same practices. See, FTC statement [4 pages in PDF] that it will take no action against Google with respect to search bias, and story titled "FTC Concludes Its Investigation of Google" in TLJ Daily E-Mail Alert No. 2,504, January 7, 2012. The CW, which is a frequent Google critic, stated in a release that "Google's latest proposal to settle a European antitrust investigation does nothing to solve the underlying problem of how the Internet giant manipulates results and favors its own services in search". See also, the EC's October 21 questionnaire regarding the proposed settlement to be answered by respondents by November 25, 2013. The EC marked the proposed settlement as "Restricted Use". However, the CW published these two documents in its web site, after publication by news media. 11/6. The Federal Trade Commission (FTC) released a notice [32 pages in PDF], to be published in the Federal Register (FR), that announces, describes, recites, and sets the effective date for, changes to its Hart Scott Rodino (HSR) pre-merger notification rules. See also, FTC release. These rule changes will require that pharmaceutical companies report certain proposed acquisitions of exclusive patent rights to the FTC and the Department of Justice (DOJ) for antitrust review. However, the rules as amended do not provide that patent transactions in other industries need not be reported under the HSR Act. This notice states that these changes "reflect the longstanding staff position that a transaction involving the transfer of exclusive rights to a patent or a part of a patent in the pharmaceutical industry, which typically takes the form of an exclusive license, is potentially reportable under the Act and to clarify the treatment of retained manufacturing rights. The proposed rule defined and applied the concepts of ``all commercially significant rights,´´ ``limited manufacturing rights,´´ and ``co-rights´´ in determining whether the rights transferred with regard to a patent or a part of a patent in the pharmaceutical industry constitute a potentially reportable asset acquisition under the Act. Under the proposed rule, the retention of limited manufacturing rights and co-rights does not affect whether the transfer of all commercially significant rights has occurred." These rule changes only apply to pharmaceutical companies. However, the notice discusses patents in other industries. "Although the rule is limited to the pharmaceutical industry, to the extent that other industries engage in similar exclusive licensing transactions, such transactions remain potentially reportable events under the Act and existing rules implementing the Act. Parties dealing with the transfer of exclusive rights to a patent or part of a patent in other industries should consult with Premerger Notification Office (``PNO´´) staff to determine whether the arrangement at issue is reportable under the Act and Rules. The Commission will continue to assess the appropriateness of a rule for other industries." These rule changes will take effect 30 days after publication of the notice in the FR. 11/6. The Senate Homeland Security and Government Affairs Committee (SHSGAC) amended and approved S 994 [LOC | WW], the "Digital Accountability and Transparency Act of 2013". Sen. Mark Warner (D-VA) and Sen. Rob Portman (R-OH) introduced this bill on May 21, 2013. It has been referred only to the SHSGAC. This bill requires that covered executive branch agencies disclose via the USASpending.gov web site their expenditures. It also requires that they link federal contract, loan, and grant spending information to programs. It also requires that the Department of the Treasury "shall establish Government-wide financial data standards for Federal funds" that includes "data reporting standards that ... incorporate a widely accepted, nonproprietary, searchable, platform-independent computer-readable format". 11/6. The Senate Homeland Security and Government Affairs Committee (SHSGAC) approved S 1611 [LOC | WW], the "Federal Data Center Consolidation Act of 2013". 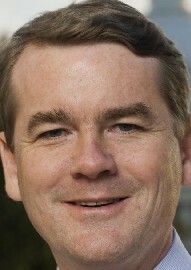 Sen. Michel Bennet (D-CO) introduced this bill on October 30, 2013. The original cosponsors are Sen. Kelly Ayotte (R-NH) and Sen. Tom Coburn (R-OK). It has been referred only to the SHSGAC. The Government Accountability Office (GAO) released a report [26 pages in PDF] titled "Data Center Consolidation: Strengthened Oversight Needed to Achieve Billions of Dollars in Savings". Sen. Bennet (at right) issued a release that offers this summary: "This bill would require participating federal agencies to submit complete data center inventories and a consolidation strategy, which must include a timeline for implementation and cost-savings estimates. The legislation includes hard deadlines, and participating agencies must also submit annual updates on their progress for the next five years. In addition, the law would require the GAO to verify agency data center inventories, and would direct OMB to routinely report to Congress on cost savings realized to date." This bill is not yet in Thomas. However, it is a reintroduction of an amendment offered by Sen. Bennet and Sen. Coburn during Senate consideration of S 1392, the "Energy Savings and Industrial Competitiveness Act of 2013". See, Congressional Record, September 17, 2013, at page S6532. 11/6. The European Commission (EC) announced in a release that it is investigating the proposed acquisition of Telefónica Ireland by Hutchison 3G UK. The EC stated that it "has opened an in-depth investigation to assess whether the planned acquisition of Telefónica Ireland by Hutchison 3G UK (H3G) is in line with the EU Merger Regulation. Both companies provide mobile telephony services in Ireland. The Commission has concerns that the transaction may reduce competition in the markets for retail mobile telephony and for wholesale access and call origination in Ireland."